Then they took Jesus from Caiaphas to Pilate’s headquarters. It was early in the morning. They themselves did not enter the headquarters, so as to avoid ritual defilement and to be able to eat the Passover. So Pilate went out to them and said, ‘What accusation do you bring against this man?’ They answered, ‘If this man were not a criminal, we would not have handed him over to you.’ Pilate said to them, ‘Take him yourselves and judge him according to your law.’ The Jews replied, ‘We are not permitted to put anyone to death.’ (This was to fulfil what Jesus had said when he indicated the kind of death he was to die.) Then Pilate entered the headquarters again, summoned Jesus, and asked him, ‘Are you the King of the Jews?’ Jesus answered, ‘Do you ask this on your own, or did others tell you about me?’ Pilate replied, ‘I am not a Jew, am I? Your own nation and the chief priests have handed you over to me. What have you done?’ Jesus answered, ‘My kingdom is not from this world. If my kingdom were from this world, my followers would be fighting to keep me from being handed over to the Jews. But as it is, my kingdom is not from here.’ Pilate asked him, ‘So you are a king?’ Jesus answered, ‘You say that I am a king. For this I was born, and for this I came into the world, to testify to the truth. Everyone who belongs to the truth listens to my voice.’ Pilate asked him, ‘What is truth?’ After he had said this, he went out to the Jews again and told them, ‘I find no case against him. But you have a custom that I release someone for you at the Passover. Do you want me to release for you the King of the Jews?’ They shouted in reply, ‘Not this man, but Barabbas!’ Now Barabbas was a bandit. So when Pilate saw that he could do nothing, but rather that a riot was beginning, he took some water and washed his hands before the crowd, saying, ‘I am innocent of this man’s blood; see to it yourselves.’ Then the people as a whole answered, ‘His blood be on us and on our children!’ So he released Barabbas for them; and after flogging Jesus, he handed him over to be crucified. Pilate then called together the chief priests, the leaders, and the people, and said to them, ‘You brought me this man as one who was perverting the people; and here I have examined him in your presence and have not found this man guilty of any of your charges against him. Neither has Herod, for he sent him back to us. Indeed, he has done nothing to deserve death. I will therefore have him flogged and release him.’ Then they all shouted out together, ‘Away with this fellow! Release Barabbas for us!’ (This was a man who had been put in prison for an insurrection that had taken place in the city, and for murder.) Pilate, wanting to release Jesus, addressed them again; but they kept shouting, ‘Crucify, crucify him!’ A third time he said to them, ‘Why, what evil has he done? I have found in him no ground for the sentence of death; I will therefore have him flogged and then release him.’ But they kept urgently demanding with loud shouts that he should be crucified; and their voices prevailed. So Pilate gave his verdict that their demand should be granted. He released the man they asked for, the one who had been put in prison for insurrection and murder, and he handed Jesus over as they wished. Pilate went out again and said to them, ‘Look, I am bringing him out to you to let you know that I find no case against him.’ So Jesus came out, wearing the crown of thorns and the purple robe. Pilate said to them, ‘Here is the man!’ When the chief priests and the police saw him, they shouted, ‘Crucify him! Crucify him!’ Pilate said to them, ‘Take him yourselves and crucify him; I find no case against him.’ The Jews answered him, ‘We have a law, and according to that law he ought to die because he has claimed to be the Son of God.’ Now when Pilate heard this, he was more afraid than ever. He entered his headquarters again and asked Jesus, ‘Where are you from?’ But Jesus gave him no answer. Pilate therefore said to him, ‘Do you refuse to speak to me? Do you not know that I have power to release you, and power to crucify you?’ Jesus answered him, ‘You would have no power over me unless it had been given you from above; therefore the one who handed me over to you is guilty of a greater sin.’ From then on Pilate tried to release him, but the Jews cried out, ‘If you release this man, you are no friend of the emperor. Everyone who claims to be a king sets himself against the emperor.’ When Pilate heard these words, he brought Jesus outside and sat on the judge’s bench at a place called The Stone Pavement, or in Hebrew Gabbatha. Now it was the day of Preparation for the Passover; and it was about noon. He said to the Jews, ‘Here is your King!’ They cried out, ‘Away with him! Away with him! Crucify him!’ Pilate asked them, ‘Shall I crucify your King?’ The chief priests answered, ‘We have no king but the emperor.’ Then he handed him over to them to be crucified. Then the soldiers of the governor took Jesus into the governor’s headquarters, and they gathered the whole cohort around him. They stripped him and put a scarlet robe on him, and after twisting some thorns into a crown, they put it on his head. They put a reed in his right hand and knelt before him and mocked him, saying, ‘Hail, King of the Jews!’ They spat on him, and took the reed and struck him on the head. After mocking him, they stripped him of the robe and put his own clothes on him. Then they led him away to crucify him. Now the men who were holding Jesus began to mock him and beat him; they also blindfolded him and kept asking him, ‘Prophesy! Who is it that struck you?’ They kept heaping many other insults on him. Then Pilate took Jesus and had him flogged. And the soldiers wove a crown of thorns and put it on his head, and they dressed him in a purple robe. They kept coming up to him, saying, ‘Hail, King of the Jews!’ and striking him on the face. 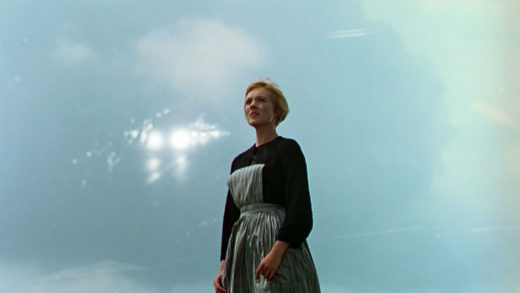 ‘A clip of Julie Andrews as the novice Maria from the opening scenes of The Sound of Music (1965) is layered over an extract from Psycho (1960). The looped clip of Andrews taking a single breath is so short that she appears as a still figure set against a background of clear blue sky, her chin lifted and head raised as she stares straight ahead. Her hand brushes against her skirt as it flaps gently in the wind; her chest rises and lips press shut as she breathes in; she blinks. The blue of the sky and the innocence suggested by Maria’s religious vocation is in contrast with the footage from Psycho, which cuts in and out to reveal the view through a car windscreen driving along a highway at nightfall. To begin with, it is daytime and the road is clear, but with each subsequent fade in, the on-coming traffic gets heavier and vehicle headlamps are switched on as the light disappears. Rain starts to fall, obscuring the view through the windscreen so that only the glare of the lights can be seen, before the windscreen wipers are switched on. They swing backwards and forwards, dividing time like the arm of a metronome in sync with the soundtrack which has been slowly building in intensity from the upbeat and harmonic opening bars to the urgent strumming and distorted guitar in the middle section of Ingenting’s Re:re:re. The action of the wipers is directly aligned with Andrews’ figure, slicing through her body in a way suggestive of the Grim Reaper’s scythe, and in this context indicative of the violent death to which Jesus is condemned. Towards the end of the work, the car arrives at Bates Motel. This is where Marion Crane (Janet Leigh) is murdered by Norman Bates (Anthony Perkins) after he has assumed the identity of his own mother Norma. The film is based on Robert Bloch’s novel of the same name and both the novel and the film explain that Norman suffered years of emotional abuse by his mother, which accounts for him becoming ‘psycho’.